Over Golden Week, on several long flights with AC power, I got bored and wrote a script for determining which data plan is most likely to cost the least over time. Now, I've released the source code as a MATLAB function (that also works in GNU Octave – with some caveats). It uses data consumption information you supply to consider the probability of future usage, then calculates the corresponding total cost based on different plans and overage costs. ¥12,500 + ¥2,000 =¥14,500/month for 17 GB versus ¥16,000 for the 20 GB plan. That would save ¥36,000 over a 2-year contract. However, if total usage is highly variable from month to month, the decision on which is best becomes more complicated. The purpose of this function is to give you a better idea of how variable usage can affect the total cost. In many cases, like I demonstrated at the bottom of this post, there may be no significant difference between all the options. In the linked case, which is based on my actual usage, I'm only looking at a difference of about ¥80 each month between the most expensive and least expensive options. 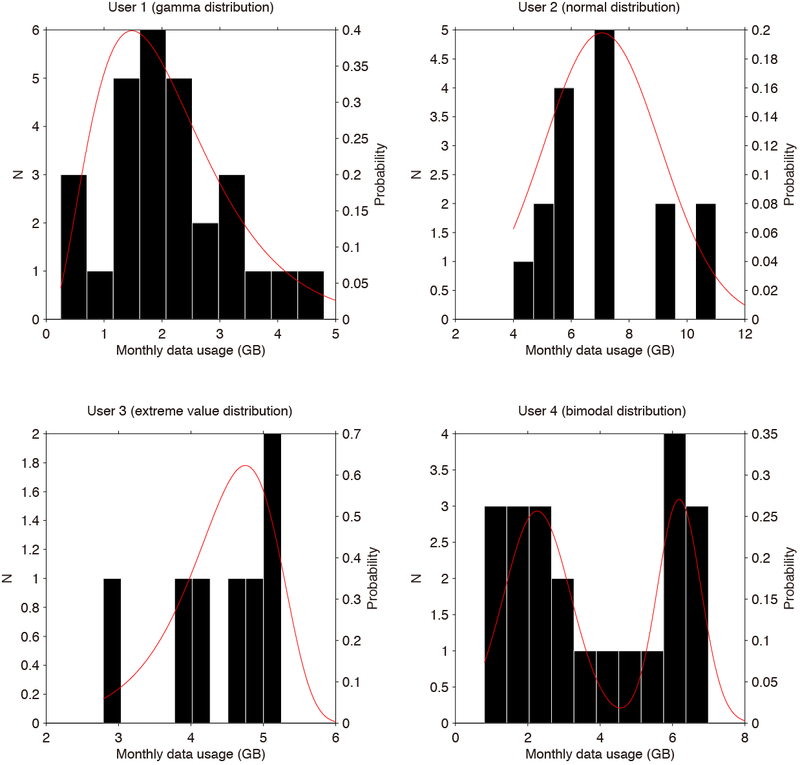 The function then fits a probability density function to your data using the specified distribution and randomly draws monthly total data consumption values for the period of time specified (default is 24 months, the typical mobile contract length). This is repeated one thousand times to converge on the most probably outcome with an idea of the degree to which extreme cases are likely to occur. It next calculates the cost based on supplied quota, overage, and additional SIM card pricing. There is a built-in assumption (that can be changed) that if the quota would be exceeded with only four days remaining in the billing cycle, that no additional data are purchased and everyone suffers through at 128 kbps. The defaults are for NTT Docomo and depend on the number of devices/people being considered: 2 devices assumes a phone and data-only tablet; 3 or more assumes all phones. Required, optional and default inputs, as well as GNU Octave compatibility, are described on the wiki page. This is "example 1" included with the function. It considers a family of four people sharing a single data plan. The first person (mother) uses a moderate amount of data but tends toward lower amounts with the occasionally high-usage month. The next person (son who downloads who knows what over mobile) uses massive amounts of data, often in the double digits, and the usage is fairly regular each month (normal). The third person (daughter) is the opposite of the first, typically using a lot of data but on occasion uses very little. The final person (father) has months where they hardly use any data (overseas business), and months were he uses a lot, with little in between. Past data usage for each member of the family of four. You can probably guess that the 10 GB plan won't do, and you would think about either the 15 GB or the 20 GB plan. The 15 GB plan at first seems like it could save a lot of money over time based on the average usage, but how many months will that extreme value of 23 GB occur? Let's run the simulation to get an idea. 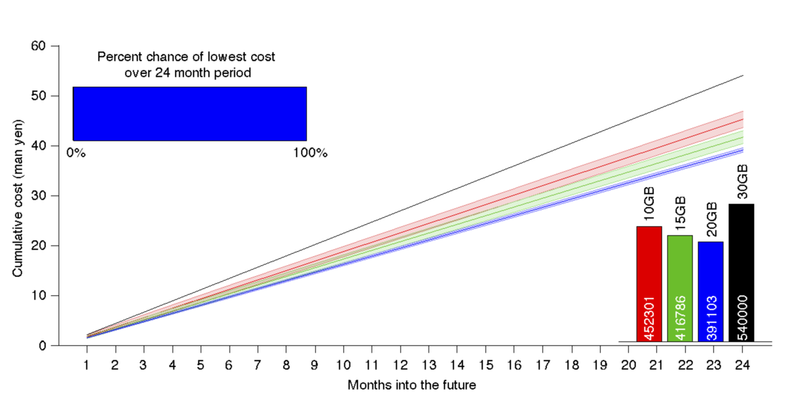 Cumulative cost with 1-standard deviation range shown for each data plan (10, 15, 20, and 30 GB). And we see that the 15 GB plan may not be the best after all. The interplay between all the different usage patterns causes high consumption enough times over the next two years to make the 20 GB plan clearly less expensive (though not by a huge amount). In this particular result, the 20 GB plan was least expensive in 99.6% of the simulations. Based on this, and keeping in mind this is only as good as the assumption that past usage will reflect future usage, I would be virtually certain that this family would spend the least amount of money on the larger 20 GB plan. Sorry, off topic, but does anyone know whether the One Plus One is going to be coming to Japan, and whether it will be compatible with Docomo in particular? NTT Docomo to offer iPad. Who cares?